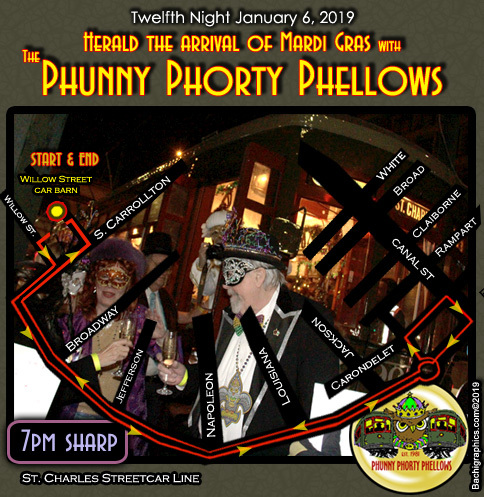 The Phunny Phorty Phellows will once again take to the rails on Twelfth Night, Sunday January 6, 2019. They will gather at the Willow Street Car Barn at 6:30. Members from the Krewe of Oak will be on hand to toast the Phellows. At 7pm there will be a Carnvial Countdown and cutting of the ribbon and the Phellows, all masked and costumed, will board the streetcar. They will ride the St. Charles Ave. Streetcar Route to Canal. We'll conclude our ride at Willow Street Car Barn and will then attend our Coronation Ball. The Storyville Stompers will accompany us during our ride. Whether you usually spend your nights dining out, staying in for a bit of Poker online or heading to Broadway to see the next Tony Award winner, the Phunny Phorty Phellows offers you a one of a kind night. The Phunny Phorty Phellows first appeared on Fat Tuesday, 1878, when they began the tradition of following the Rex parade. Since that time, the Phunny Phorty Phellows have made distinguished themselves as one of the liveliest additions to Mardi Gras with their hijinks and well-meaning mockery of the day’s events (one 1881 float depicted Rex’s traditional symbol, the Boeuf Gras, as a heifer). The original Phunny Phorty ceased parading and ultimately disbanded in 1885. In 1981, 83 years after their predecessors’ last parade, a new group of Phellows emerged to revive the irreverent tradition as members of the Krewe of Clones (the impetus of today’s wildly ribald Krewe du Vieux). In 1982 the Phunny Phorty Phellows became the official heralds of Mardi Gras with their Twelfth Night ride in a traditional New Orleans streetcar announcing that, at last, the pre-Lenten season of “phun and phrivolity” had arrived.